Every time I read the news about the ice storm in New England, I suffer a thrill of deja vu. You see, 35 years ago, I lived in Connecticut when a devastating ice storm hit. Of course, at the time, I was ten years old and it didn't seem "devastating" at all to the kid who had just moved to the wilds of Connecticut from the South Jersey suburbs. First of all, it meant no school. Second of all, it was beautiful. 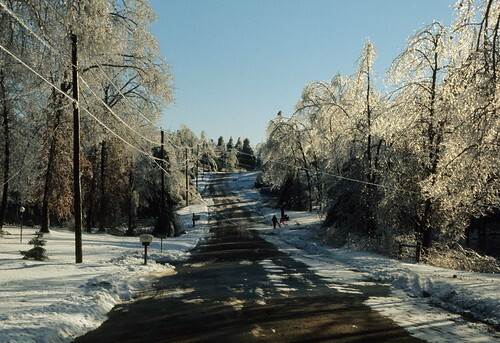 Connecticut Ice Storm, Dec 1973, originally uploaded by Captain Oblivious. The world had turned to crystal overnight. The picture above doesn't quite capture it: Weston, Connecticut was maybe a little more rural, or maybe Godfrey Road East was simply too well shaded for the road surface to melt: for several days, at least, the combination of sand and snow made it appear we lived on a dirt road. Ah. This one does it: this could be the top of the hill above our driveway. Right down to the fallen branches and trees. We had already had about six inches of snow on the ground, and the ice made a crust on top of that. It was just almost strong enough to bear my weight; I remember trying to slide across the glazed surface. I'd put my booted foot out, and gently try to slide and then CRUNCH! I'd break through. I remember the toboggan went down the hill like a rocket. The old Radio Flyer sleds would punch through the ice and stop dead. But once my mother realized that we wouldn't have power to run the water pump for at least a week, she curtailed our out-door playtime. She didn't want us to get too ripe. Although what she actually said at the time was "I don't want you getting your snow suit all wet when there's no way to dry it!!" I grumbled about the two fire places we were keeping going. "What if we run out of wood?" she replied. Now, of course, I'd know to reply "then we're gonna die so I might as well spend my last day sledding!" But I was younger, then. The house had two fire places, one at either end of the house, in keeping with the Colonial design that was all the rave back then. But the house only LOOKED colonial; it had been built just before we moved in. And true to the America of the pre-OPEC oil crisis, it lacked adequate insulation. Only the living room was really comfortable; the family room at the other end of the house was built over the garage, and there was no insulation in the floor. And with the cathedral ceiling it was always a tough room to heat up in the winter. It did allow the christmas trees to get taller every year; I think the last one was about 12' tall. But that was later. It was our first winter in Connecticut. We'd moved just before Thanksgiving, and a lot of our stuff was still in boxes in the basements. We had firewood for the fireplaces, and Dad went out and got some more somewhere; the little cluster of stores that comprised the center of town were open without power, selling emergency supplies to folks like us. We had a lot of canned goods, and obviously, refrigeration wasn't a problem. But we wouldn't be cooking on the electric range. On one of his first forays out of the house, Dad picked up a case of Sterno. We might have had a few cans already in for chafing dishes: my folks liked entertaining back in the day. Mom would keep a kettle close to the fire in the family room fireplace (which was next to the kitchen), and put it over the Sterno can for a final heating up. Breakfast was cold cereal and hot chocolate, lunch was sandwiches and soup, and so was dinner. A lot of our neighbors went to stay "in town," which meant they went to Westport or even Norwalk, to stay in a hotel. Or with family who had power. As I said, we'd just moved in, and we didn't know a lot of people in town yet. Add to that the fact that we'd just paid for a major move and a new house, and Christmas just weeks away, heading into town and paying for a hotel simply wasn't an option. This turned out to be a Very Good Thing. You see, the people who fled their dark homes for hotels in town just packed up and drove away. Very few of them thought to drain all the water out of their houses, first. That might've been OK for a weekend, even a long weekend. But over the course of a week, their houses reached the ambient temperature of 25 degrees Fahrenheit - several critical degrees below zero. The water in the pipes froze, and water expands when it freezes, and the result was the complete destruction of 80% of the plumbing in town, including the radiant hot water heating used in most of the homes then. A town of 8,000 had damages around $20 million all told: pipes, fixtures, floors and walls all had to be replaced. On day five, the phones were back up and a family from church who lived in town offered to let us stay at their home. Hot baths for all! Television! On day six, our power was back on and we went home. There was never any sense of urgency in my parents; they simply took stock of the situation, came up with a plan, and acted. I suppose that's why I did so well in the aftermath of Katrina and Wilma; I'd been through that. You figure out what you have, discover what you need, figure out where to get it, and move on. But my thoughts are with those people hunkering down for another cold night in a land turned treacherously beautiful by the hand of nature. I've been there. Atlanta International Gets It Right.